Posted in Chicken, Soups, on September 20th, 2008. 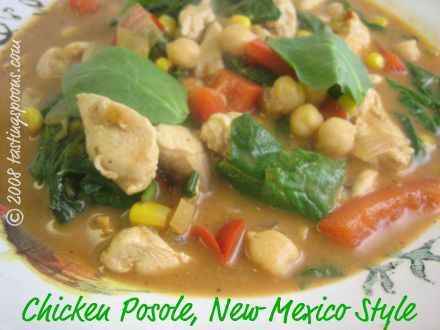 The first time I had posole was my first visit to Santa Fe, New Mexico. That was about about 20 years ago, I’d guess. It was a culinary tour, and the guide packed in 4 days of day and night eating, shopping, museums, tours and more food. It was heavenly fun. The food was out of this world. If you’ve ever had a food epiphany, then you can relate to what I felt on that trip. I realized I was truly enamored with Southwestern food. I’d never even heard of posole (poh-so-leh) until that trip, and hence learned that traditionally it’s a pork and hominy stew, typical of that region. Likely you can find it in Texas too, probably Arizona as well. In the stores there you can buy posole mixes (yes, I bought one). Hominy isn’t something I buy at all – I bet I’ve only purchased it a couple of times in my life (canned). But hominy is a requirement for this recipe. However, I didn’t have any. What to do? I used garbanzo beans instead. Not exactly authentic, but close. In my repertoire of recipes I found one for posole made with chicken, so it at least gave me the formation of this recipe since chicken was what I had defrosting for the evening meal. The soup came together in rapid order – maybe not quite 30 minutes, but almost. The recipe I was reading suggested you add a can of enchilada sauce. Well, I didn’t have that either. So I made my own. Well, actually, I just added the ingredients to the soup. Then I added in my own tweaking here and there (chipotle chiles in adobo sauce, some powdered cocoa), and now I’ve got a new soup recipe for my collection. This soup was fantastic if I do say so myself. Now, I will say, I used Penzey’s turkey soup base concentrate for this recipe. And, if you read my blog piece a few days ago, you know that I’m a huge fan of Penzey’s soup bases. And once again, it provided a delicious depth of character to what was a relatively simple soup. The spinach is added in at the last and is barely cooked. I used baby spinach, which made the bites manageable. If you buy regular spinach, you’d best chop it up a little. 1. In a large nonstick skillet or soup pot add the raw chicken cubes with the 2 tablespoons of water. Cover, but stir frequently and cook until most of the water is gone. Remove lid and increase heat and cook until chicken pieces are lightly browned and cooked through. Remove to a plate and set aside. 2. Into the same pan add the olive oil, then add the onion. Saute until onion has begun to wilt, then add the red bell pepper pieces. Stir a bit and cook for about 2 minutes. Add the garlic and continue stirring for one minute. 3. Add the flour to the chicken pieces and toss until the chicken has absorbed nearly all the flour. 4. Add the water and bouillon concentrate (or use chicken stock in lieu of the water and concentrate/granules) and bring to a simmer. Reduce heat, then add the cocoa powder, chile powder, tomato sauce and oregano. Add the canned corn and bring to simmer again. Add the chicken pieces that have been set aside along with the cream. Bring to a simmer again, then add all the spinach leaves and stir in until they’re all covered in soup. Per Serving: 466 Calories; 17g Fat (32.3% calories from fat); 39g Protein; 42g Carbohydrate; 9g Dietary Fiber; 116mg Cholesterol; 1019mg Sodium. Sounds great! I have too many frozen chicken breasts from costco in the freezer. This recipe will be a good use for them. I just made some tortilla soup and this soup will be next. Do you add the chipolte along with the tomato sauce, chili pwdr, etc. ? I will probably have to throw in a little cilantro too. I’ve been using the knorr chic cubes for my soups, but ordered some of the penzeys chic soup base, can’t wait to use it! Being a native of NM and the southern region (though I’m not naive with Northern NM), I must say that there is a completely different cooking style between the North and the South. Quite frankly, I prefer the southern style of Mexican food over the North. No comparison whatsoever between the regions. I also must say that “chile” in the north is bland and sweet, and “chile” in the south is warm to hot, garlic, onion, oregano, and no sweet! Taste for yourself, however, nothern “Mexican” food is tex, newmex, mex, and the real thing is southern New Mexico!